That’s because entanglement, a voodoo-like phenomenon in quantum physics linking particles that once interacted, seems to surpass the speed of light, violating the cosmic speed limit. Because of this, it doesn’t fit in with Einstein’s theory of relativity, so he concluded that it was too ludicrous to be real. But it is real, as physicists proved last year. And it’s actually going to be pretty useful, whether for a form of computing that is exponentially faster than what we have now, the creation of unbreakable codes and a more secure internet, or even for solving problems in chemistry and developing new drugs and materials. Here’s how entanglement works. Imagine your friend is holding two matchbox cars — a green car and a yellow car, one in each hand. If he mixes them up behind his back, their information becomes “entangled” in a way — if he unfolds his right hand and reveals the green car, you know that the yellow car must be in his left hand. Now imagine these are special cars — quantum cars. Until your friend reveals one to you, they are undefined, shifting randomly between green and yellow with equal chances of being either colour, Cosmos explains. But once you look at one car, the colours of the balls stop changing. If the car you’re looking at has frozen at green then you know that the colour of the other car must be yellow. So in a sense, the green car has affected the yellow car. And this can happen at any distance. If you have one friend standing in front of you with one car and another friend standing on, say, the moon with the other car, the cars are still entangled, instantaneously affecting each other. So having information about one particle in an entangled ensemble reveals an “unnatural” amount of information on the other, Phys.org reports. “It allows us to look at one particle that interacted with another particle in the past and know what other particle’s state is — even if we can’t read it because it’s on other side of universe,” Alberto Peruzzo, a senior research fellow with RMIT University’s School of Engineering and Director of RMIT’s Quantum Photonics Laboratory, told Business Insider. Unlike classical computers, which are binary and limited to just 0 and 1 (on or off), quantum computing uses particles that can exist in multiple dimensions, and can be 0, 1, 2, or more. “So much more information can be stored and transmitted,” said Zixin Huang, a PhD student working on the experiment, to Phys.org. 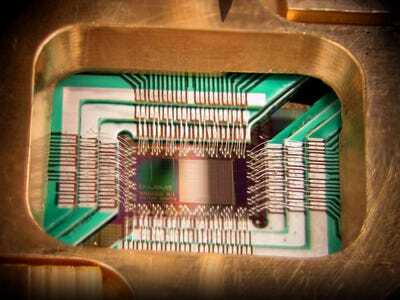 Quantum computing relies on entanglement between individual particles to store information. But there’s a catch. In order to move forward with quantum computing, scientists have to find a way to make sure the particles in question are actually entangled. They key ingredient to the new method is something called ‘mutual information,’ which quantifies the amount of information obtained about one random variable, through another random variable.